As a quick recap, the key difference between the ‘Ui2′ and Di2 is cabling – a two core, not quad core wire is used. While that renders the two incompatible, it does benefit the overall look as the Ultegra level cabling and connectors are noticeably slimmer. Ui2 doesn’t have the carbon and titanium paraphernalia (some of which was tucked away out of sight in Di2 anyway) but that doesn’t really affect the overall aesthetic, which is practically identical. 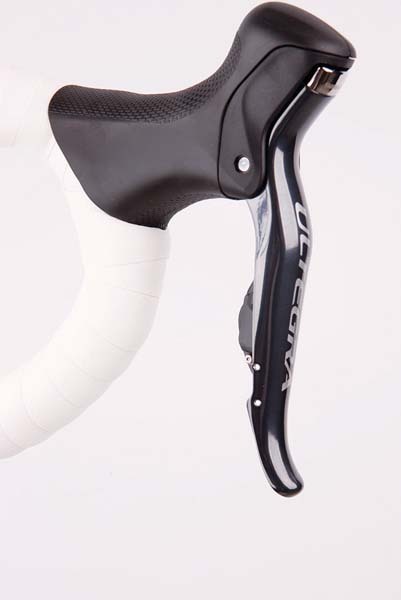 Even the alloy brake levers look like their more expensive uni-directional carbon brethren. 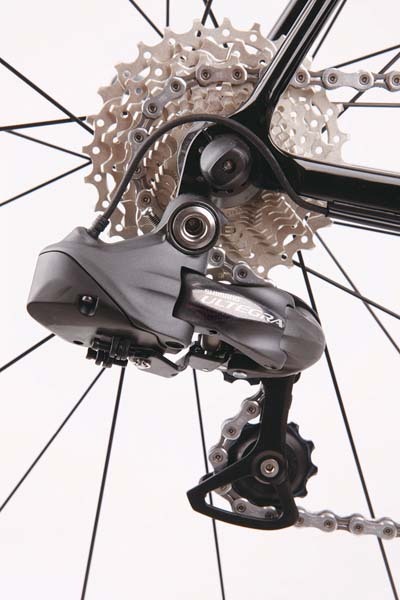 It takes a keen eye, or comparison directly next to Di2, to spot the little extra bulk in the derailleurs. Ergonomically too, the shifter hoods are identical, covered in the same soft rubber compound and retaining the same easy-to-use lever reach adjuster. So relatively little difference is apparent when stationary, but the real deal is what came to light out on the road. Honestly, and indeed surprisingly, it’s much the same story. 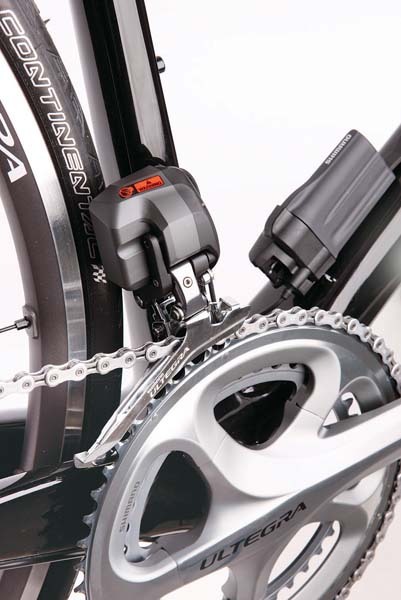 Ui2 retains the auto trimming front mech, a stand-out feature of the Di2 kit, plus, thanks to driving down costs by buying in considerably greater bulk, Shimano has used the same Li-ion battery as Di2, with incredibly long run times. I’ve regularly achieved three months between charges. Shifting quality is just ever so slightly behind the sharpness of the Di2. If we could describe Di2 shifting response as ‘blink of an eye’ then Ui2 would be ‘two shakes of a lamb’s tail’. It’s nit-picking, as the difference is barely worthy of mention, and only perceptible to me having ridden Ui2 straight after Di2 – but it’s there. As to where that’s coming from, I’d confidently say, given our previous experimentation mixing Di2 with 105 kit, it’s not the fault of the Ultegra drivetrain. It’s most likely to be down to the slight change in motor spec, also responsible for the marginally bulkier mechs. Shimano’s head engineer on the project, Takao Harada, explained the Di2 mech uses a custom-made motor – in Ui2 it’s a more readily available, generic model. There’s an audible difference in the motor sound too, if you’re used to Di2. But let’s not labour a point here; if you’re getting on the electronic bandwagon for the first time with Ui2, which will be the case for most, then you’ll never know this difference exists and you’ll be blown away by the shifting quality just the same. It’s hugely impressive that it’s this close to Di2, at such reduced costs. One small gripe is if you want to shift through several gears rapidly, you must press the button the required amount of times, which can be a bit awkward. For my money, I’d have liked to have seen a ‘press and hold’ multi-shift option built in at the Ui2 level. It would be a useful feature, especially given Shimano’s aim to reach a wider audience with the much lower pricing for Ui2. These days it’s normal to go to a garage and plug your car into a computer to find out what is wrong with it. So, what about coming home from a ride and plugging your bike in to your PC for a quick diagnostic check? Although it’s unlikely that many of us would want to shell out around £175 extra for a diagnostic kit, we’d certainly predict the majority of retailers will invest. Once you’re plugged in and the software is running, you can do a full system check, or just check individual components, with the diagram showing a ‘healthy green’ or ‘up the chute red’ outline to the components. There’s also an option to reprogram the function that each button performs. Weirdly, that means you could program the left-hand shifter to operate the rear derailleur, or if you like to have both the large buttons controlling up and down on the rear mech, and the smaller buttons up and down on the front. Why you’d want to stray from the standard format, though, beats us.